EDINBURG, Texas (November 17, 2018) – The Rio Grande Valley Vipers (4-2) stay undefeated at home with a win against Stockton Kings (4-3) on Saturday, November 17. After one period of play the Stockton Kings claimed a 25-17 lead. Cameron Reynolds and Kalin Lucas led the offensive charge with five points apiece. The Vipers kept pace and limited the damage with the help of Brandon Sampson’s four defensive boards. Collectively RGV tallied seven blocked shots in the first. Danuel House racked up 13 points, four rebounds and two steals by the midway point. The Vipers sparked a late run but were unable to overcome the 10-point difference. Stockton had two players leading the way at the half who surpassed the double-digit point mark. Kalin Lucas and Daniel Ochefu both totaled 12 points. Brandon Sampson with six defensive rebounds and Zhou Qi with five of his own defensive boards helped keep the score within reach at the half. More of the same ensued in the third period of play with the Kings continuing their lead. Despite being down 81-70 the Vipers pressed efficiently on defense. Brandon Sampson took over the point lead for the Vipers with 16 totals, including four assists, and eight total boards. An electric fourth quarter pushed the Vipers into the lead 106-101 at the 1:42 mark. Six members of the Viper roster tallied double digit points as the game neared its end. The Stockton Kings went home with seven players posting double digit points, Kalin Lucas led the pack with 21 totals. Daniel Ochefu took charge defensively and racked up eight total rebounds. The late comeback was sparked by Sampson and kept the home team hungry resulting in a big 111-106 win for the RGV Vipers. 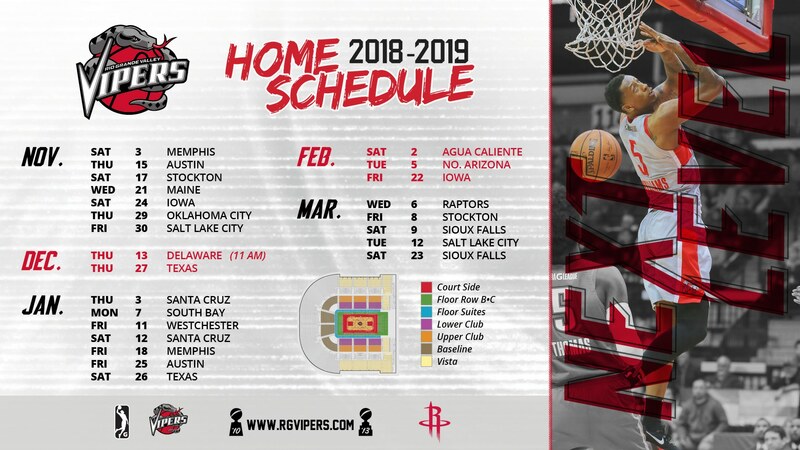 The Vipers will travel to play Texas Legends on November 20 then come back for another home game right before thanksgiving on November 21 against Maine at 7 p.m. For more information, contact the RGV Vipers at 956-56-ARENA or visit www.rgvipers.com.